Shot by the MLB pitcher himself at the Grand Canyon. 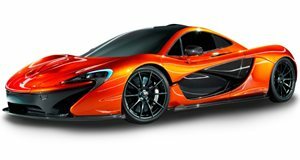 We've already seen some pretty unique McLaren P1's delivered and hitting the streets of the world's top cities in a stupefying range of colors. But just when we thought we'd seen it all, here comes this insanely finished P1, owned by MLB pitcher C.J. Wilson. Wilson, who is best known as being the pitcher for the Los Angeles Angels of Anaheim, is apparently also an amateur photographer and quite the gearhead. His P1 is finished in one-off Cerberus Pearl paint with brushed gold wheels. To really expose the full range of his car's transforming purple shades, Wilson headed out to the Grand Canyon for a mesmerizing photo-shoot.